Portrait of Baseera Khan, 2018. 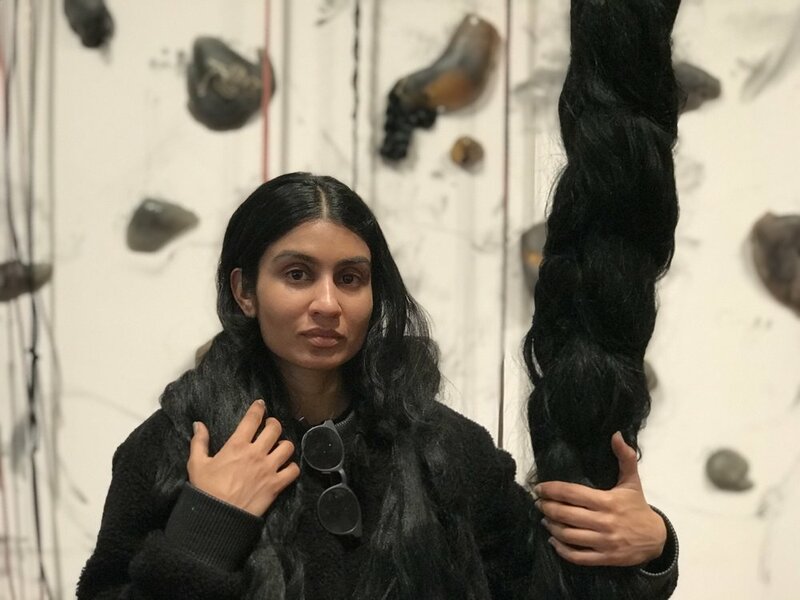 Baseera Khan is a New York based artist whose work shares experiences of exile and kinship shaped by economic, pop cultural, and political situations. She mixes consumerism with spiritually and treats decolonial histories, practices, and archives as geographies of the future. She received her BFA from University of North Texas and MFA from Cornell University. She attended Skowhegan School of Painting and Sculpture (2014). Recent group exhibitions include In Practice: Another Echo, Sculpture Center, Long Island City (2018); Rituals, Aspen Art Museum (2018); Long, Winding Journeys: Contemporary Art and the Islamic Tradition, Katonah Museum of Art (2018). Her solo exhibition iamuslima (2017) produced by Participant Inc. in New York City, has since traveled to Moudy Gallery at Texas Christian University, Fort Worth (2017) and Colorado Springs Fine Arts Center at Colorado College (2018). Khan currently has work up at Osmos Address, NYC until the end of June 2018. Khan is currently part-time faculty at NYU and was recently appointed MFA Art Practice Summer Faculty at SVA (2018). She is co-curator of the next Queens International and will be an artist-in-residence at Pioneer Works in Fall 2018.